In our latest update to this sub-$1,000 page, we gave everything a big shakeup. We removed a few harder to find speakers, such as the ADAM A5X and KRKRokit 10-3 G3, although several replacements came in. These included the PreSonus Sceptre S8, the Neumann KH 120 A, and the Pioneer RM-07, as well as the return of the Yamaha HS8! Just like any audio equipment – from an electric guitar to a pair of headphones – the more money you can invest in monitoring speakers, the better the performance you will end up with. While you can find excellent monitors at under $500 – or even at under $300 – it’s when you have a grand in your pocket that real high-end performance becomes available to you. In today’s article, we are going to show you what $1,000 will buy. We have selected a handful of higher-end monitoring speakers worth adding to your shortlist, before offering a short guide to what makes a grand’s worth of monitors different from their cheaper counterparts. Let’s dive in! One of the clearest, flattest and most accurate monitors on the market. Sensational sound from this unique coaxial speaker. Performance oriented design from one of the best brands on the market. Pioneer’s hefty little monitor with a solid performance. Coming in at the top of this chart is the KH 120 A from Neumann, who have clearly used their decades of experience in high-end mic manufacturing to produce a bi-amplified studio monitor of exceptional quality. It’s not cheap, but this compact speaker features an incredibly stylish design and a bulletproof construction, with top features. These include a magnetically-shielded woofer and tweeter, with an ‘Elliptical Mathematically Modelled Dispersion’ waveguide. This all translates to a flat response and incredible accuracy – perfect for all kinds of critical listening. Check out the full review of the Neumann KH 120 A for more details. One of our favorite speakers on this list comes from none other than PreSonus, who deliver the interesting Sceptre S8 coaxial speaker. With plenty of features and a simple but sophisticated design, this awesome monitoring speaker uses PreSonus’s proprietary ‘CoActual’ design that sports an 8” woofer with a horn-mounted 1″ diaphragm compression driver right in the middle. This combines to deliver an accurate output that sounds the same wherever you are standing. Overall, the output is incredibly flat and honest, although not boring – it has plenty of life, as we highlight in the complete review of the PreSonus Sceptre S8. Yamaha's HS series includes three models of different sizes. HS8 is the largest set you can get, and it is every bit as impressive as its relatives. We are looking at a monitor capable of delivering great levels of transparency combined with a wider lower end. On top of that, Yamaha has made sure that HS8 have plenty of volume and power, ensuring more than enough headroom should you need it. The absolute best thing about these speakers is just how competitively they are priced. Let's just say that you are getting a lot of value for your money. Yamaha HS8 will work great both in smaller and medium sized studios. Focal's speakers are usually found in the top tier segment of the market. However, this brand has designed a whole line of monitors aimed at budget users who want to tap into that Focal goodness. Alpha 65 is one of those models, and it is hard to beat for the money. Focal did have to cut a few corners, but nothing that impacts performance. These bring an extremely transparent response and plenty of headroom to the table. With an aluminum inverted tweeter, those trebles have a come out clinically accurate, which is something that extends to higher mids as well. Overall, Focal Alpha 65 are truly amazing studio monitors for the money. Another new addition to this list is the RM-07 from Pioneer. While the Japanese brand aren’t well-known for studio-grade monitoring speakers, the performance on offer from this hefty little speaker may go some way to changing that. With a slightly bulging design, this compact speaker features a sturdy aluminum case, with a coaxial driver comprising a 1.5” Hard Dome aluminum tweeter and 6.5” Aramid fiber woofer to deliver a very large sweet spot. As we highlight in the complete RM-07 review, there’s plenty of flatness and clarity, but just as much life in this monitor. o many beginners and casual producers, spending up to $1,000 on a set of monitors might sound like overkill. After all, how much transparency do you really need? While the answer is ‘quite a lot actually’, no matter how experienced you are or what kind of music you are mixing, transparency and a flat response is not the only metric on which to measure expensive monitors. If transparency was the only important thing, you would start seeing professional producers running out to grab a cheap pair of modded monitors. In reality, they will look the best studio monitors they can afford for several reasons. Let’s take a closer look at these. We have touched upon it already, but transparency and a flat response is paramount when it comes to monitoring speakers. When buying a set in this sub-$1,000 category, that is exactly what you will receive – incredible transparency and instrument separation, which will give you a clear insight into your mix, including the subtlest of details. A cheaper pair of monitors can also offer a flat response in comparison to its overall frequency range, however if you were to look at the graph of that response, you would see oscillations. These can be anywhere from +-5 dB and rather stacked. With a $1,000 set, those oscillations will be much less pronounced. However, this doesn’t mean the sound is lifeless. Critical listening and lengthy studio sessions can be good fun on high-end speakers as the overall tone is one of quality, while retaining the required transparency. For example, the bass will be better. Not particularly louder or more prominent, but bass with a more natural and nuanced sound – one that doesn’t get muddy. Not to be mistaken for volume, power is another important metric. Look at it this way: some speakers pack 200 watts per cabinet while others offer just 20 watts. However, both of these will result in a max SPL of 104dB. This sounds illogical, but the difference is how much headroom each speaker offers. The 20-watt set will have to work extremely hard to reach its claimed max SPL. On the other hand, achieving the same volume for the 200-watt unit would be a breeze. When you don’t have power and you want more volume, the most common problem you will run into is distortion, which occurs when you push speakers past their capabilities. Naturally, this is something you want to avoid when producing high quality audio. Not only does distortion completely mess up the perception of the music you are trying to mix, but it can easily affect the longevity of your speakers. When it comes to features, expensive speakers simply offer more. You will often find more extensive EQ and power controls, as well as more versatile I/O options. Of course, not all these features will be necessary for you – if you need just a simple XLR connection, having the choice of four different inputs will be of little benefit. Still, some producers like to have absolute control over their gear and buying in this price range will offer you just that. It is also in the $1,000 price range that you start to find coaxial designs, where the tweeter is essentially placed inside the low frequency driver, delivering the sound from the same point. Some producers love them, others don’t, but in this price range you have the choice. Finally, we come to the design of the speakers. Here we are not only talking about the aesthetics, but how the cabinets are designed and built. At the end of the day, cabinets are more than just houses for the transducers. You can have the best set of drivers, but that won’t mean much unless the cabs are built to complement them. The cabinets in this sub-$1,000 category allow their transducers to reach their optimal potential through quality builds and specific baffle designs that increase sweet spots. They are also built as close to ‘dead boxes’ as possible, meaning the enclosure won’t create any sounds of its own through resonance. This means less – or no – distortion, ensuring the only sound you hear is from the drivers themselves. 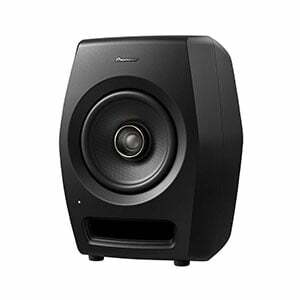 Ultimately, spending up to $1,000 on a set of studio monitor speakers makes a lot of sense if you are looking for the best performance and true sonic clarity. As a serious producer, spending this money will result in a more refined way to mix your music. The models we have shown you today are by far some of the best you can buy in this price range, having proven their worth in professional studios around the world time and again. Make sure to add them to your shortlist, then read some more reviews before making your final decision.